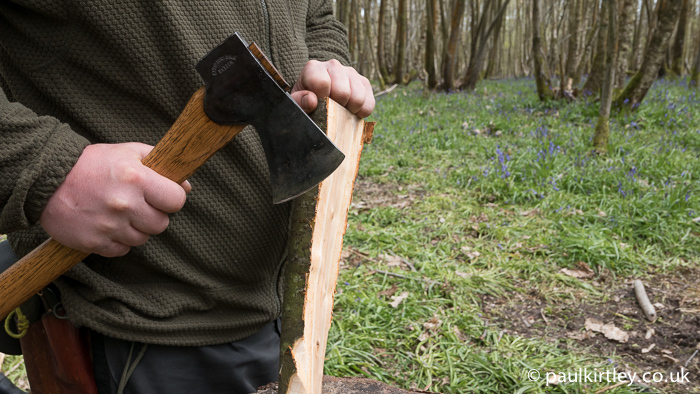 Safety in an outdoor activity, including using an axe, comes down to managing risk. Risk can be broken down into two components – likelihood and severity. While the likelihood of cutting yourself with your axe is similar to the likelihood of cutting yourself with your knife, the severity of axe wounds tend to be greater and, in the worst cases, very debilitating. An axe has more weight, more leverage and more momentum than a knife. Moreover, when out camping or making a journey, we tend not to be wearing any sort of protective clothing or footwear. 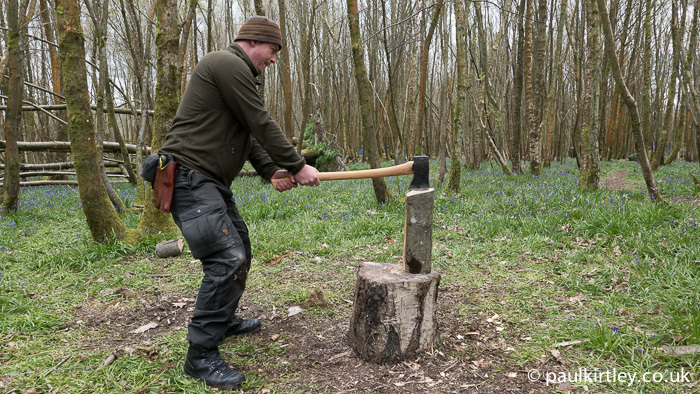 Our protection from injury with an axe has to come from care, attention and good habits. Adhering to best practice is particularly important in more remote settings. When carrying your axe around camp, make sure the axe’s mask is on. This is for your benefit and for the benefit of any companions. Modern axes by manufacturers such as Gransfors Bruk have very good quality steel axe heads which hold a very sharp edge. Even brushing the edge against clothing or skin will cause damage. The mask, however, won’t protect you from the edge under all circumstances. I’ve seen people cut straight through the metal rivets of a leather mask by forgetting to remove the cover before lightly tapping the axe into a chopping block. If you were to trip and fall onto the axe head, even with the mask on, you are likely to be badly injured. Hence, you should carry the axe in such a way that if you trip or slip and fall, then you will not fall directly onto the axe. Personally, I don’t like clipping the strap of the mask into my belt. 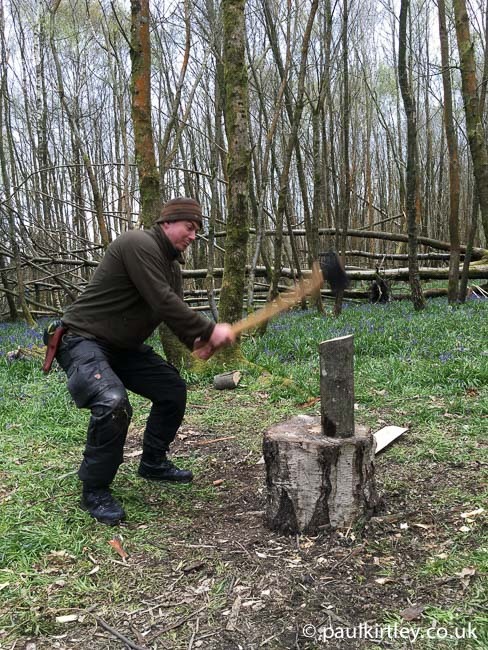 Apart from the axe flapping around at my side, the security of the axe is entirely reliant on the mask fastening staying closed, which gravity combined with the mass of the axe is conspiring against. This also stretches the mask strap. Equally, I don’t like having an axe slipped into the slot some trousers have on the side of the leg. I don’t want an axe attached to my leg if I slip or trip over. Carrying the axe in your hand in a way which allows you to jettison it to the side is far preferable. Carry your axe with the mask on. 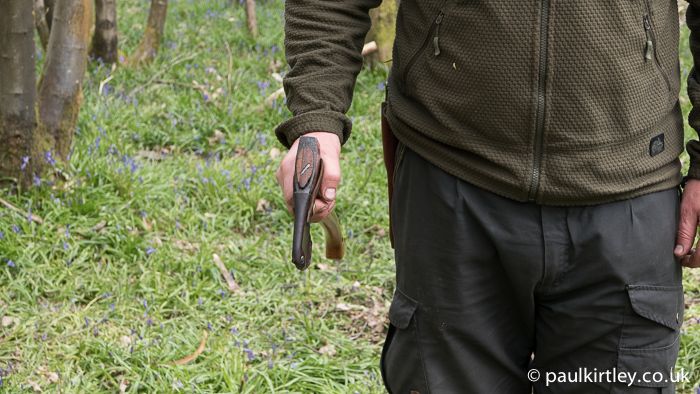 A straightforward safe and comfortable carry is to hold the handle directly below the head. 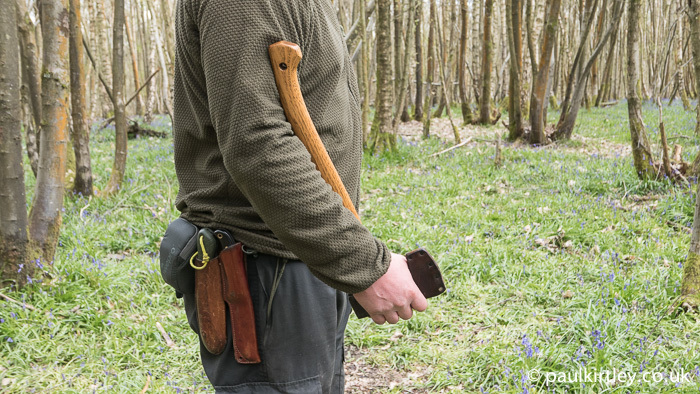 “Another well-balanced, safe carry is to grasp the head behind the bit of the axe and cradle the handle in your elbow. [caption id="attachment_7449" align="alignright" width="700"] Either in-hand carrying technique shown above allows you to easily jettison the axe if you fall. You may know where you left your axe but others may not. 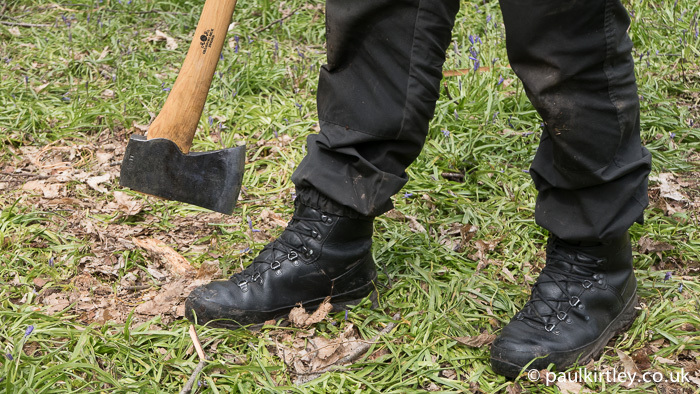 Leave your axe in such a way as to minimise people kicking, standing on or otherwise coming into contact with your axe. Even if the mask is on, an axe can injure people if enough force is applied. Also, you don’t want your axe mask, head or handle to be damaged, even superficially. 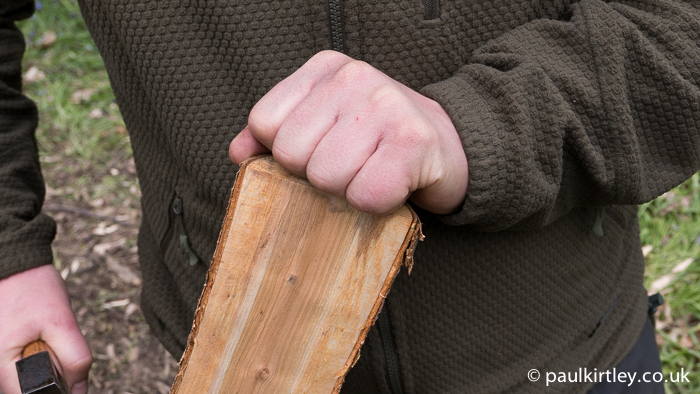 if you have spent time re-finishing the wooden handle, building up layers of linseed oil, the last thing you want is for it to be kicked across a rocky camp. If you and your companions are working with multiple tools in the woods, then it’s good to group them in a sensible place. Sometimes you need to leave your axe unmasked while you do something else for a short while, before returning to use the axe. The safest place for it, then is in a stump or a log, with none of the cutting edge exposed. 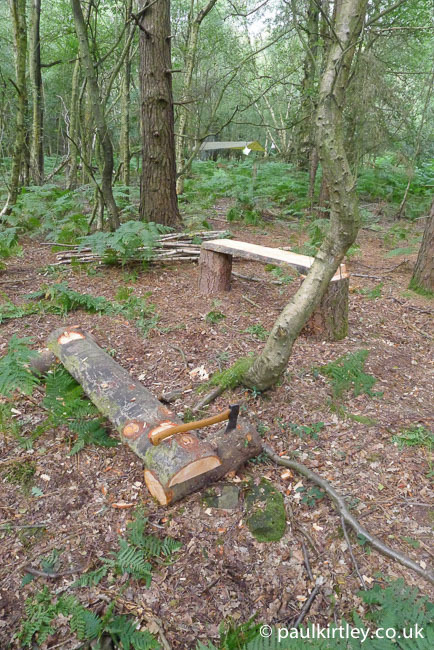 When setting up and organising your camp, give some consideration to what you’ll be doing with an axe in the area. Will you need to split firewood? Do you have a chopping block? What size axe is being swung? 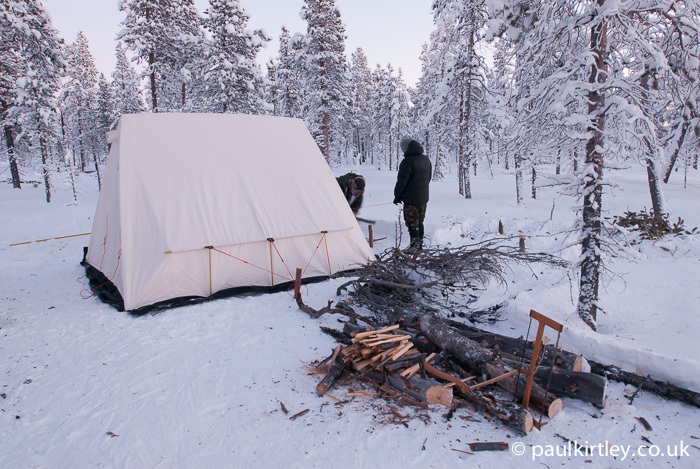 Consider other camp activities such as managing the campfire or food preparation and washing up, as well as routes to the water supply, latrine and sleeping areas. 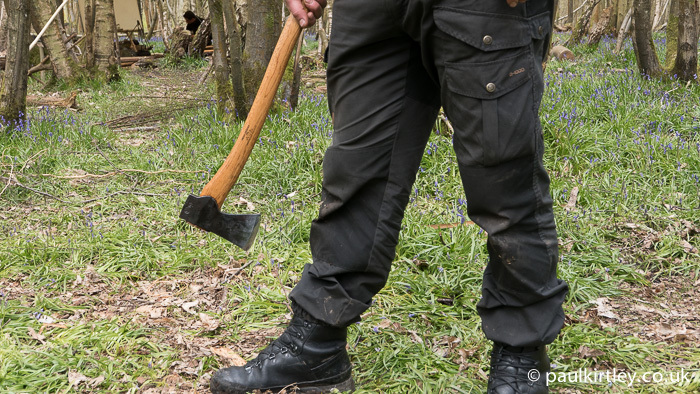 You don’t want someone swinging an axe too close to where others are working or in between areas they need to walk to and from, forcing them to walk past an active axe. 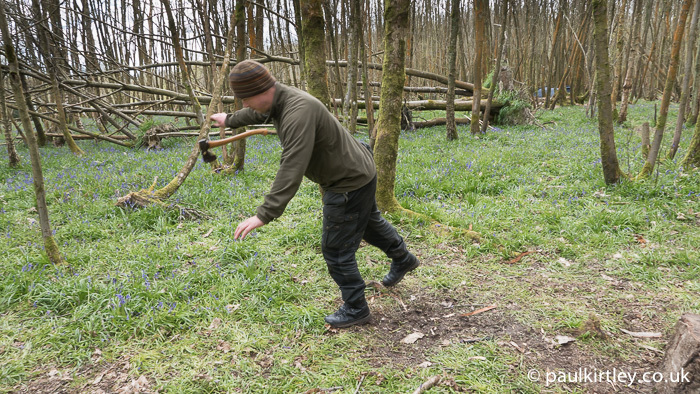 Remember, it’s not just the axe being used in situ you need to think about but also firewood being split can fly off the block as well as question of what if someone lets go of the axe by accident. Where does it go next? What happens if I slip? What happens if it glances off? What happens if it cuts straight through what I’m working on? What happens if I miss? What happens if it bounces off? In each of these cases, where does it go next? 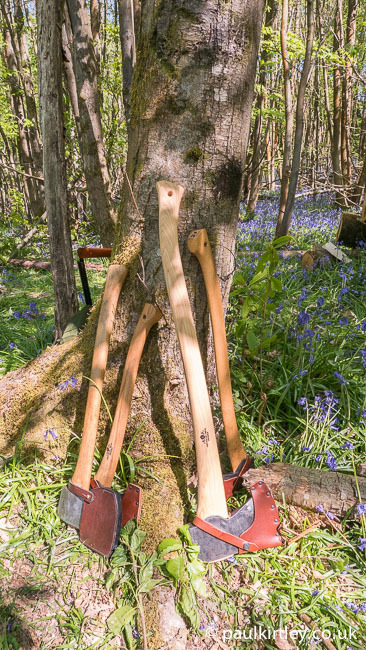 Broadly speaking, and especially in the context of popular axes on the market today, there are four sizes of axe you are likely to come across with general purpose head profiles (as opposed to more specialist axes for splitting or carving). 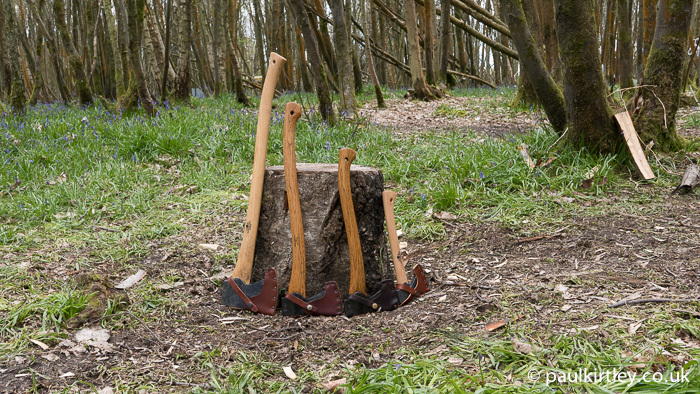 These are a hatchet, half-length axe, three quarter length axe and felling axe. 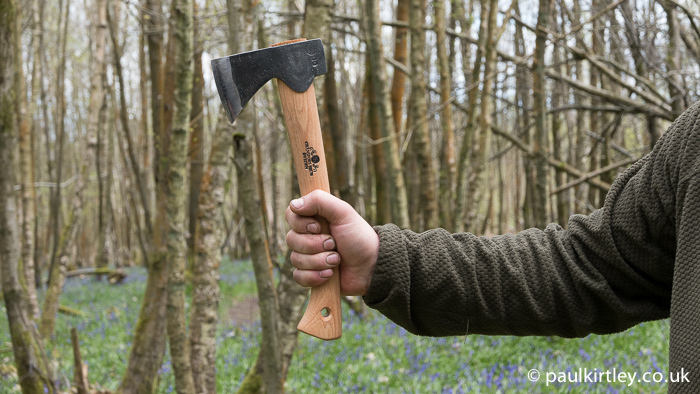 The hatchet is light with a short handle, totalling a weight of only 0.6kg (1.3lb). 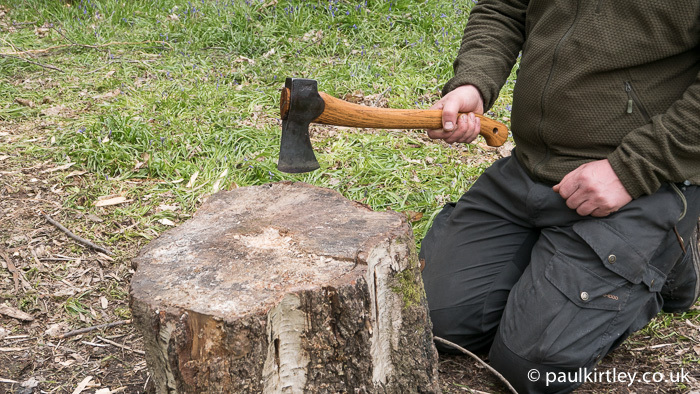 Heavier than the hatchet at 0.9 kg (2lb), the half-length axe is a versatile and portable general purpose axe but still quite short. 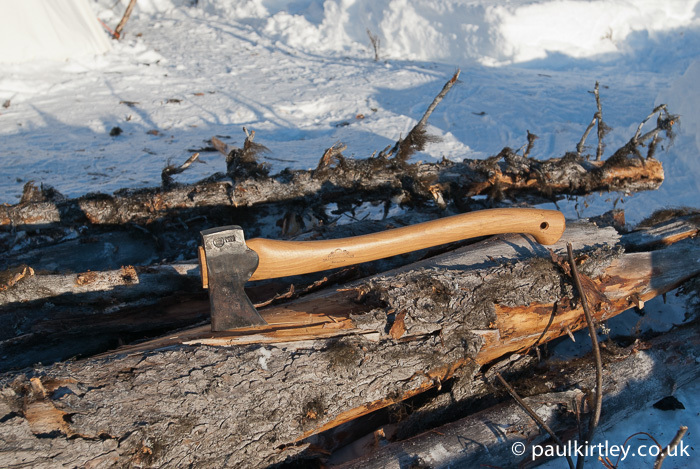 The three-quarter length handle and 0.9kg (2lb) head, make this axe great for boreal forest travel. 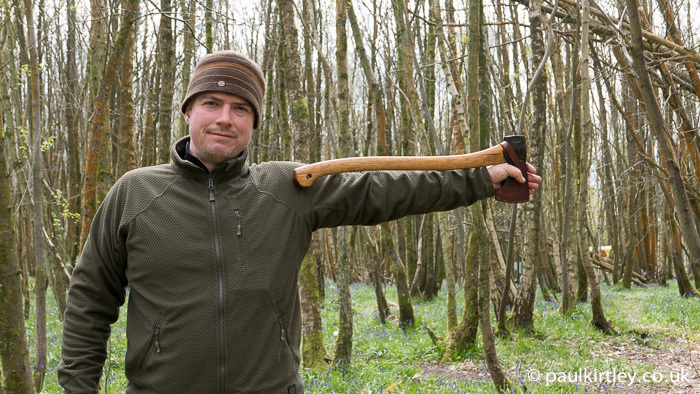 This felling axe with a 1.5kg (3.3lb) and handle coming most of the way from my fingers to my sternum is about twice as heavy as the three-quarter length axe. How each of these axes behaves is somewhat different. Different sizes of axe have different dynamics. Heavier heads increase momentum and longer handles increase leverage. Where you hold the axe also alters the way it behaves. Think about the length of the axe you are using and which parts of you lie in the arc it will be travelling on when swung. The half-length axe swings down to around my knee height. The three-quarter length axes heads towards my shin. 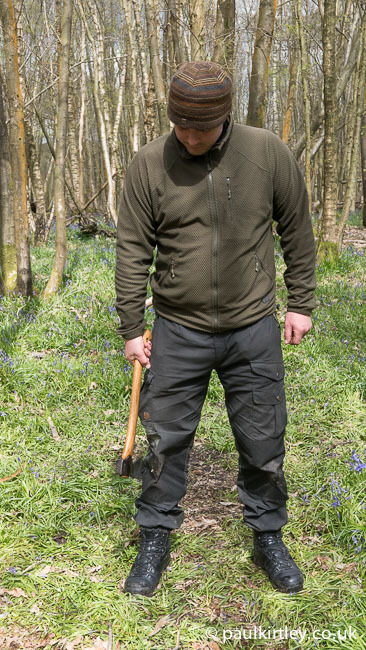 The felling axe heads towards my ankle. 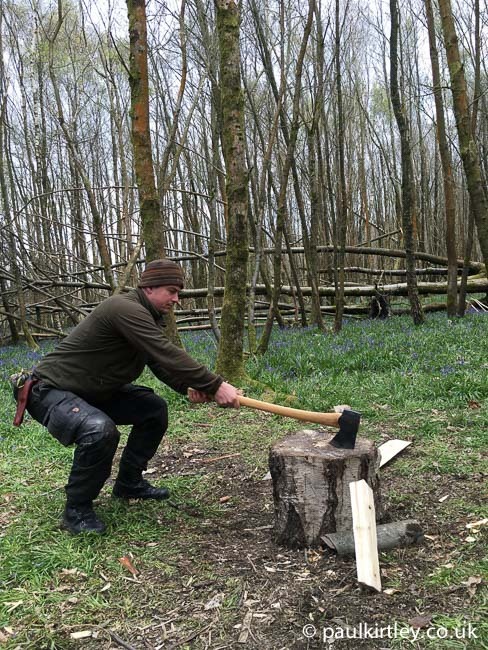 As soon as I kneel with the half-length axe, the risk to my kneecap, or any of my leg for that matter, is greatly reduced. Axes with lighter heads accelerate and decelerate more readily than those with heavier heads. Also, where along the handle you hold the axe makes a difference to how fast the head will move. When using the half-length axe one-handed, grasping the handle towards the middle, the section of handle below my hand moves in the opposite direction to the part above it. This has a dampening effect on the motion of the axe and slows down any change in direction from forwards to backwards or vice versa. Holding the hatchet the same distance away from the head as my previous grip on the half-length axe (see photos below), leaves very little of the handle below my hand. 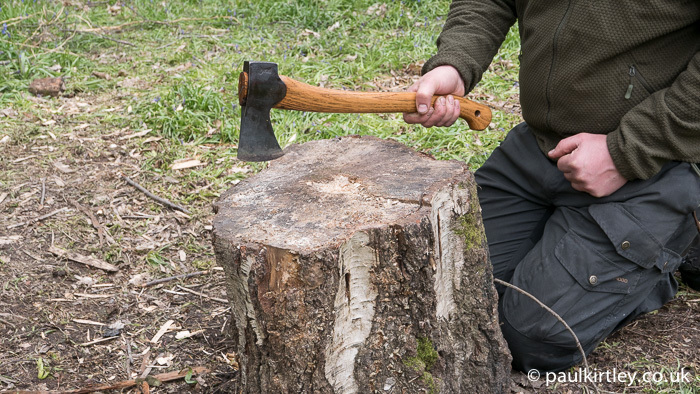 This lack of dampening combined with a lighter head, means the hatchet will bounce back towards me considerably more rapidly than the half-length axe used in a similar way. 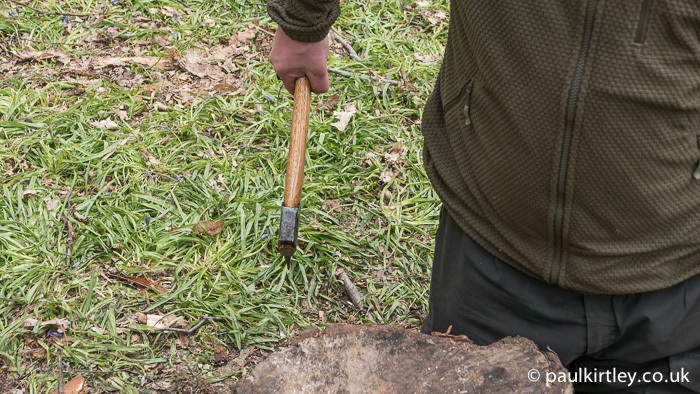 This dynamic has caused people to be hit in the face by the poll of hatchets when trying to cut side branches at or near face height. The section of handle below my hand moves in the opposite direction to the part above it. This has a dampening effect on the motion of the axe. Holding the hatchet this way leaves very little handle length below the hand. 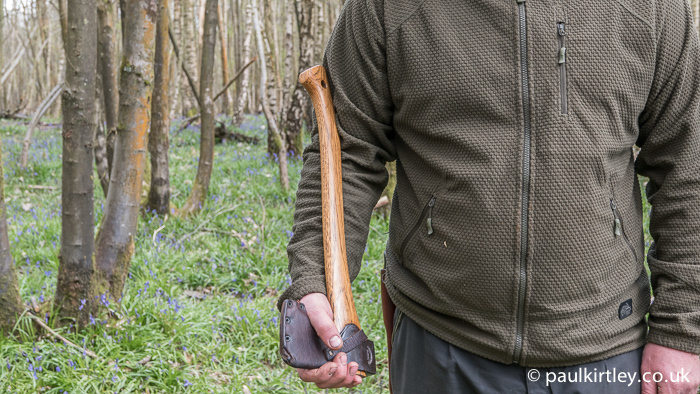 The lack of damping combined with a lighter head, means the hatchet will bounce back towards you considerably more rapidly than might be expected. 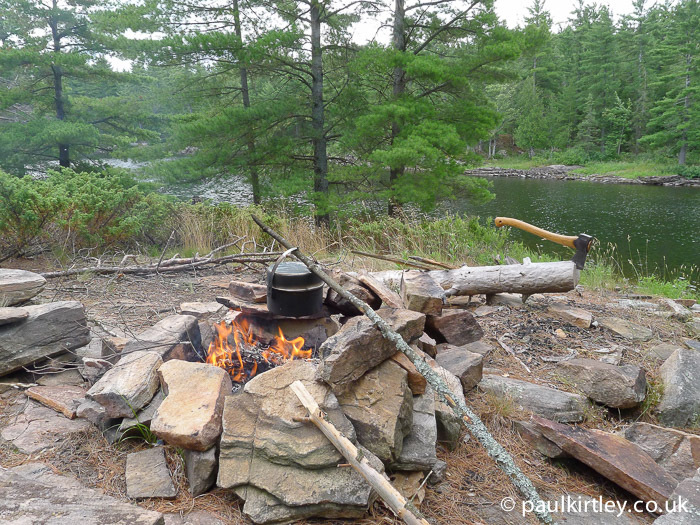 Even when you are lucky enough to have some sort of chopping block in camp, it’s often quite low. 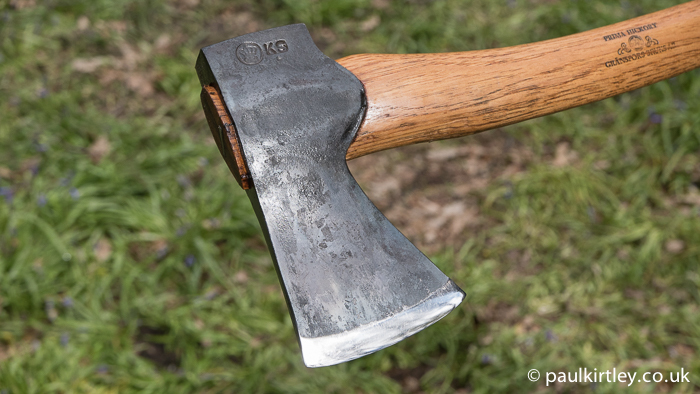 Half-length axes such as the Gransfors Small Forest Axe or the Wetterlings Outdoor Axe have become very popular in recent years. 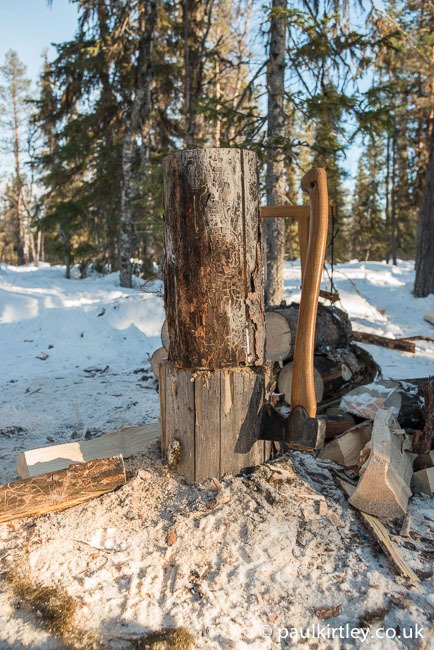 They can be used one-handed or two-handed, can be turned to many tasks from felling to carving to splitting kindling and are are highly portable. 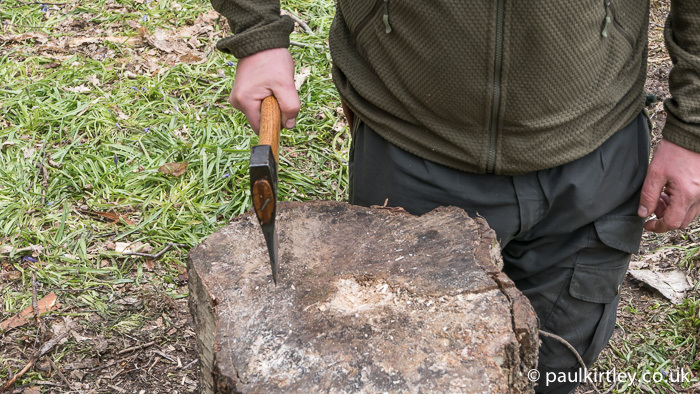 The compact size of a half-length axe, however, means that you are often better off kneeling while using it, for better body mechanics as well as for safety reasons. Kneeling in front of a chopping block presents you with a few choices. The first choice is whereabouts on the block should you work? Working on the part of the block closest to you leaves less margin for error before you miss the block. 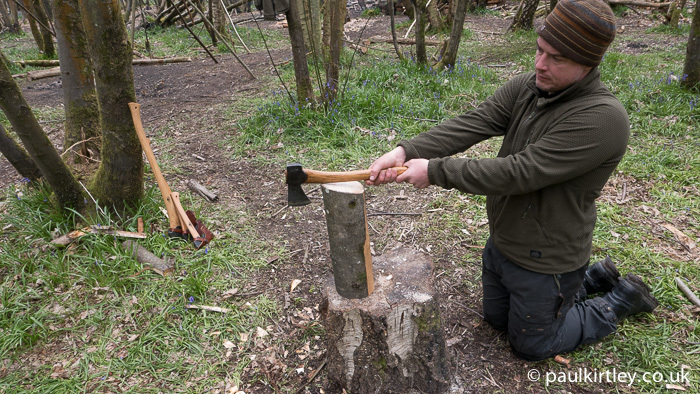 Working on the part of the block opposite your body, puts a lot more wood between you and the axe. By offsetting your body to the block, any follow-through movement will not be towards you, but alongside you. If you are splitting on a block (see later in this article) then you can keep your hands well out of the way. 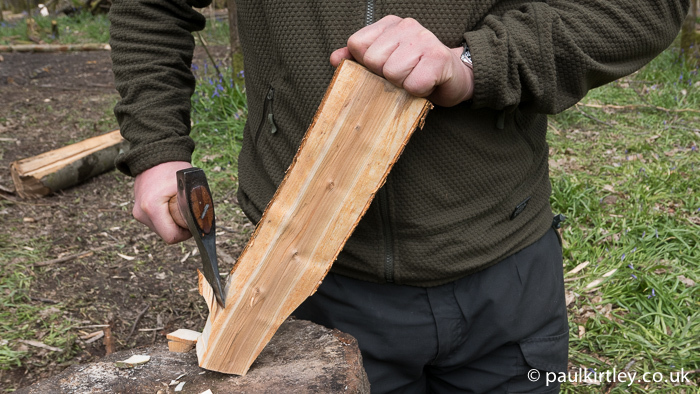 If you are carving, though, you are going to have to keep hold of the work piece, steady it or move it while working on it with the axe. 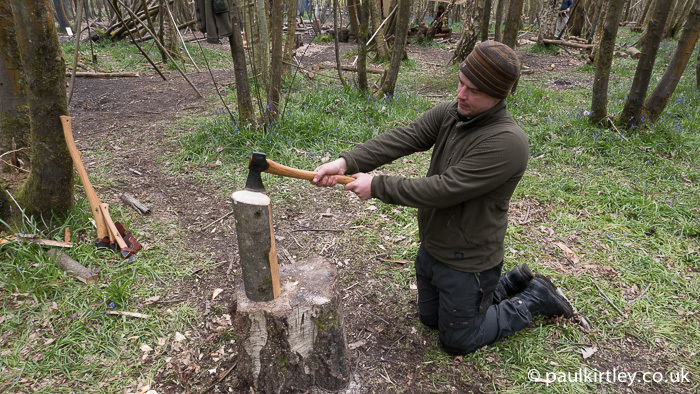 So it’s important you follow some rules to minimise risk of injury to the non-axe hand. 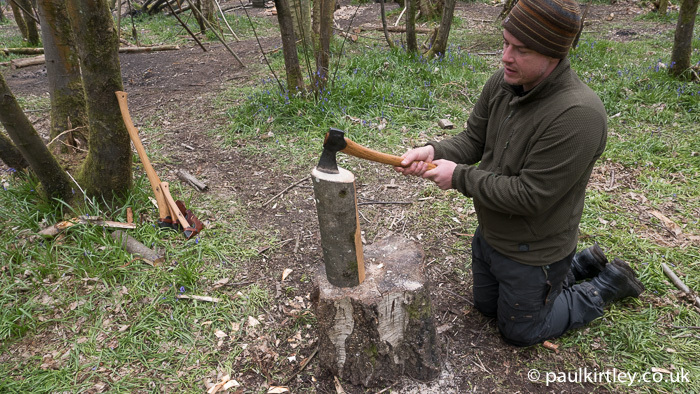 If you are carving, you have to keep hold of the piece you are working with the axe. There are a few rules to employ which will protect your hand. Act like your fingers have already been chopped off. Keep all your digits clear of the work you are doing. It’s easy to hold the work with the palm of your hand, with fingers and thumb retracted. The other important rule is not to raise the cutting edge of your axe higher than the hand which holds the work. This way, you can never accidentally cut down onto your hand. In keeping with the general principles, we will place the piece we are going to split on the far side of the block, away from us. This means that if you strike too close or glance off the wood in front of you, the next thing the axe hits is the block. More likely, though, is for someone to strike too far away. There is a tendency, when kneeling, to kneel too close. 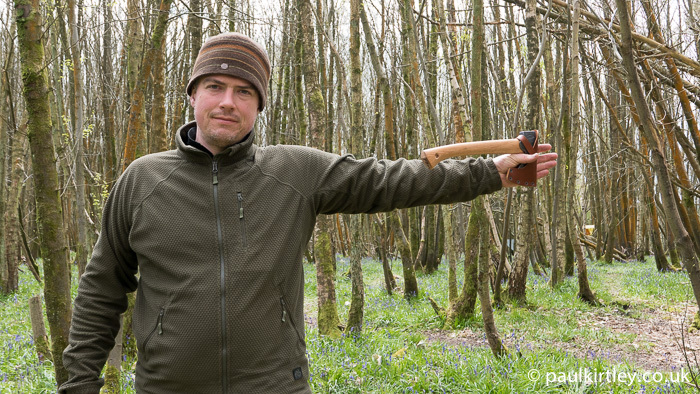 When you swing an axe with any weight, your arms tend to extend and straighten at the elbow. When inexperienced people first size up with an axe they tend to underestimate how far away the axe bit will strike. The result is the axe handle hitting the piece of wood, rather than the axe head. This leads to overstrike damage to the axe handle. Placing the log to be split on the far side of the block means any understrikes still hit the block. Somewhat exaggerated here but not uncommon is the tendency to bend the arms at the elbow when sizing up the cut. When the axe is swung with force, the arms more extended, you end up with the handle hitting the wood and the potential for overstrike damage. 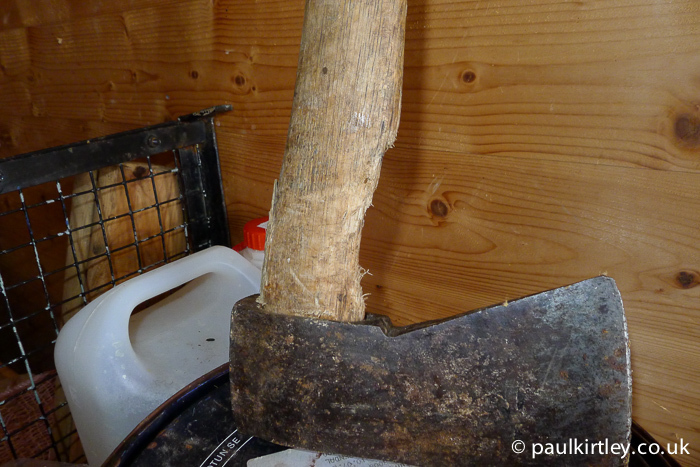 Overstrike damage on an axe in a remote cabin woodshed in Norway. Kneel further away, stretch the arms out to represent a realistic splitting strike. Then you hit your target. When using a heavier axe with a longer handle to split on a low block, kneeling is not advisable. A more powerful swing can be had standing up. Due to the weight of the axe, we can use gravity to help us. 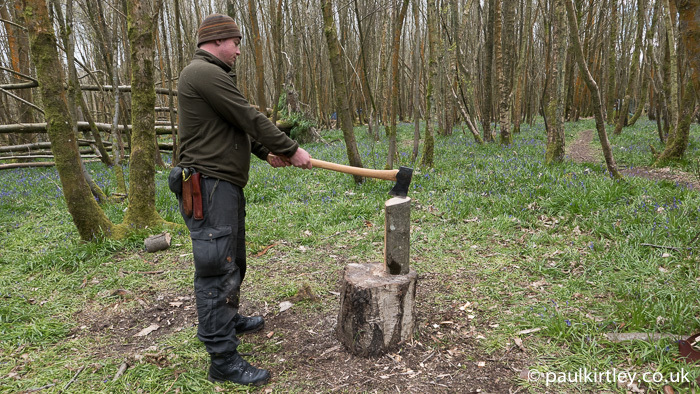 As with the smaller axe, you should size things up when you first pick up the axe, making sure you are at an appropriate distance from the block. Don’t forget to place the piece on the furthest extent of the block. With the larger axe swinging down towards your feet, that backstop of block is important. 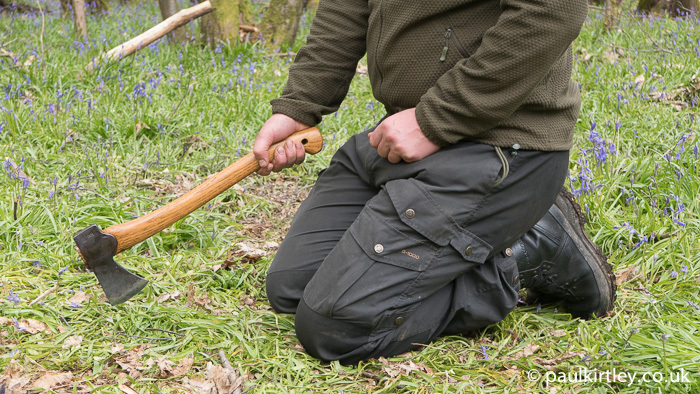 You can also improve the safety and efficiency of the swing by bending your knees to bring the axe handle more horizontal at the point the axe head hits the piece you are splitting. This modifies the path of the axe head from an arc towards you as you pivot from the shoulder joints to a more vertical drop towards the block as you bend your knees. 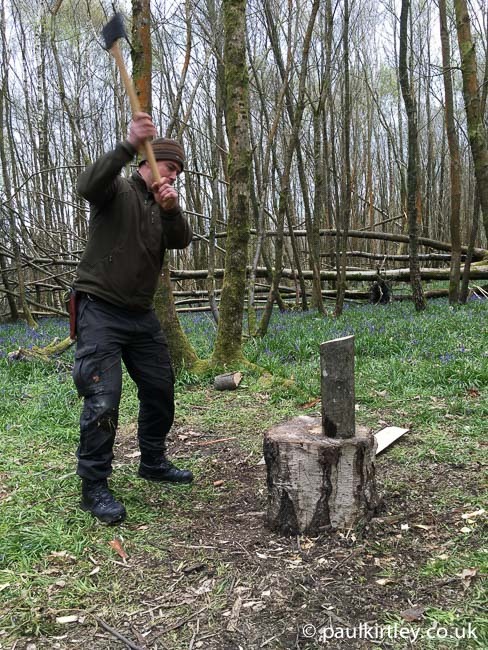 Standing up straight results in the full-size axe striking the top of the log at an angle. 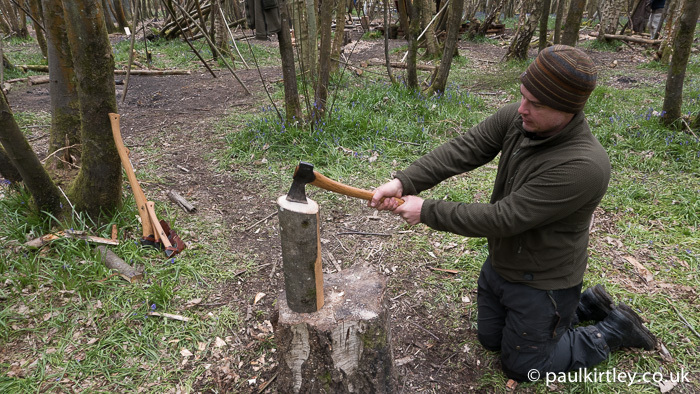 Bending at the knees results in the axe bit striking the top of the log vertically. This adjustment means the cutting edge of the axe is hitting the wood straight down, which is a more efficient cut. The key then is to follow through as much as necessary, again taking full advantage of gravity pulling the axe head downwards, rather than swinging it towards you and the ground as you rotate the swing from your shoulder. The following sequence shows a strong strike with the full-sized axe. 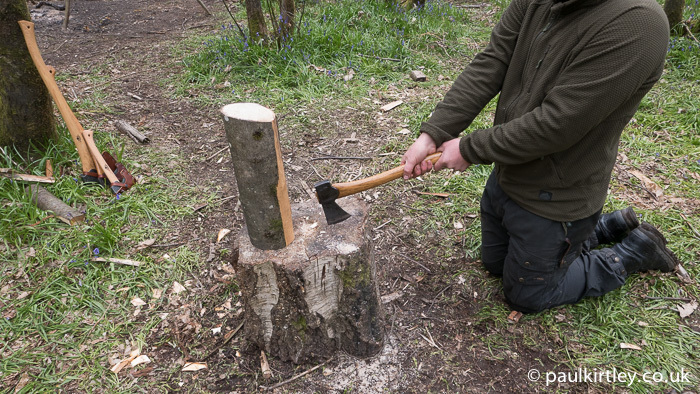 Bending at the knees modifies the path of the axe from an arc towards me to a more vertical path through the log to the chopping block. 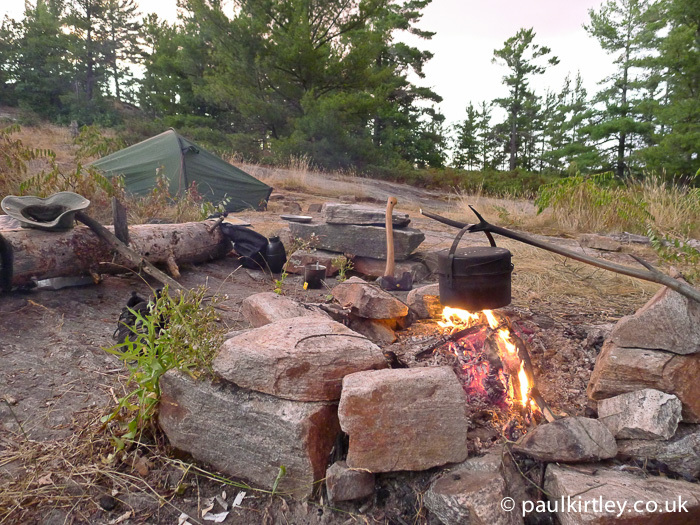 When travelling, a chopping block is unlikely to be present unless you find yourself on a relatively well used camping spot where some kind soul has furnished the site with a block. Most of the time you’ll have to work onto a log or at best a stump. Very good and detailed article on an important topic. Thank you! Anyway, do you think it is necessary for an axe to be as sharp as a knife? 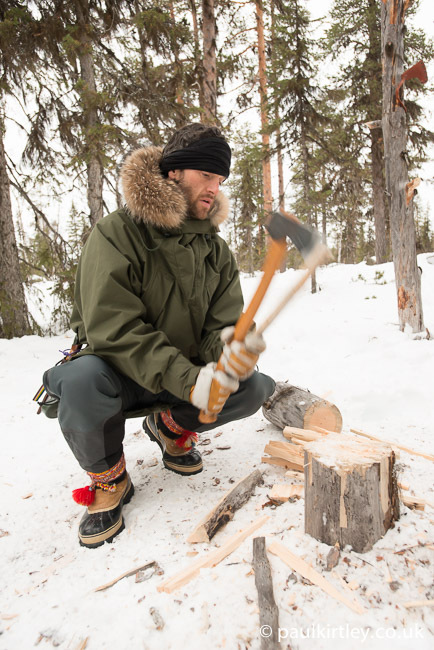 For example Gransfors axes come razor sharp, which is great for carving, but for general purposes, like chopping or splitting I’m not sure if it is actually necessary to be as sharp as it could cut hairs on arm. This is one of your best articles in my opinion. There are lots of important details I have never thought about before. 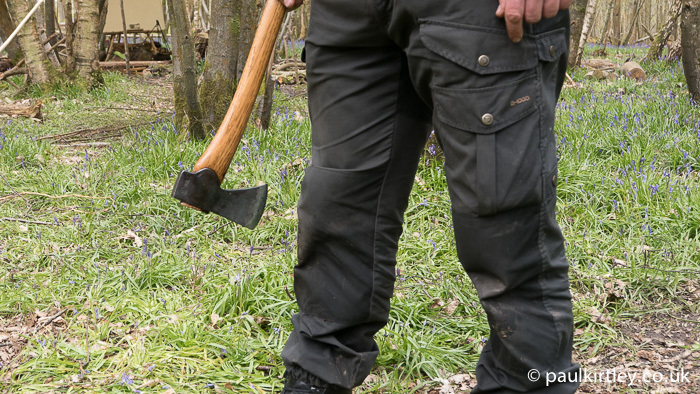 The pictures are a great help in understanding the more subtle aspects axe safety. Where I live in Québec axes tend to be marginalised in favor of jack-of-all-trade knives by most campers and hikers that I know. 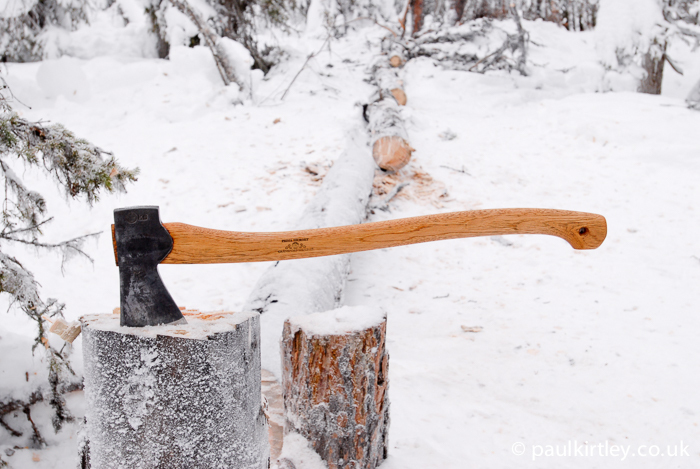 I myself only considered using an axe after discovering your blog a few years ago. It has made my time in the woods a lot easier! Hopefully this article will help foster a better understanding and greater appreciation for this essential tool. Thank you and warm regards! Great post! I really like how you inserted photos showing examples to help as the reader progresses through the topic. Although most of this is quite familiar for me, it is still a great read even for seasoned outdoorsmen to keep safety top of mind. Thank you for this great information ! 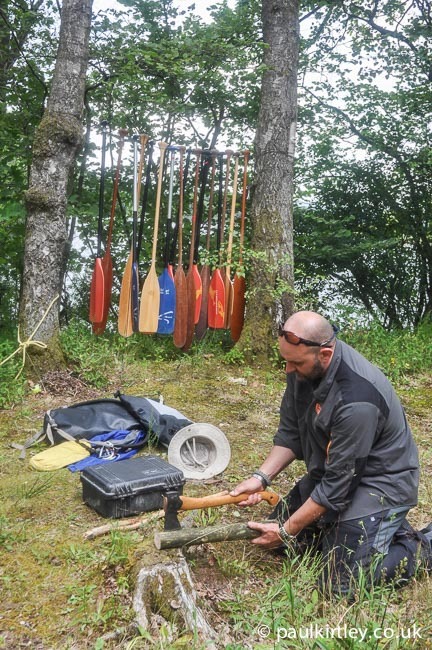 I can only recommend reading all this carefully and practice every two days working with an axe before taking it on serious trips. What Size of boots do you have in your Lowa boots and what size do you have in your Jörnkangan Boots? How satisfied are you with them? 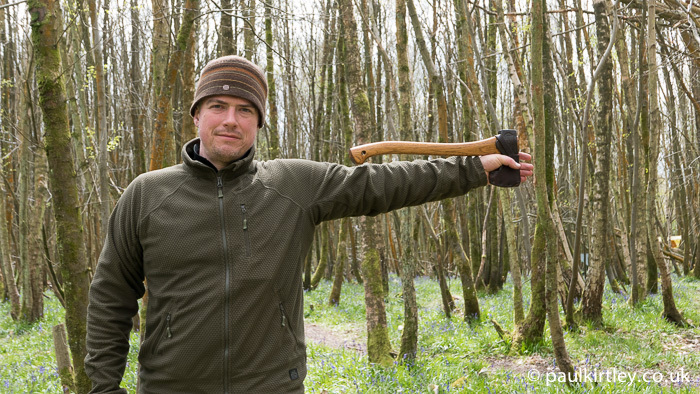 Thank-you Paul for taking the time to explain in detail how to use and care for a hatchet or axe. complete with very good tips, and descriptive pictures, on how to use them safely and keep them in good shape. One slip with any one of these tools could quickly turn your best life experience into your worst. The only thing I would add to this would be for people to ensure that their tools are kept sharp, and they practice using them as often as possible. Keep safe, keep having fun, and please keep sharing your knowledge and experiences. Great article chief. Just a thought really, I’ve seen some crazy things being done to remove an axe that is stuck, resulting in injury to the user or a damaged axe handle. Maybe it’s worth mentioning here also. 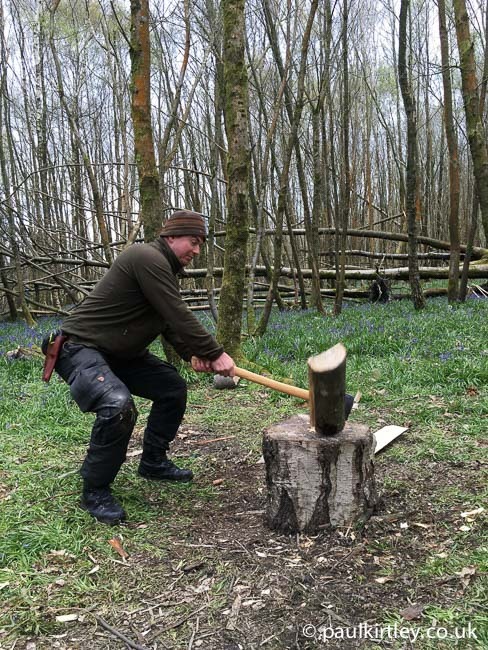 Probably the best and most concise article I have read on safe axe use, absolutely brilliant and should be read by every woodsman. Splendid advice and clear instruction, as usual! Thank you, Paul. As a Boy Scout in the ’50s (yeah, I ‘m a geezer) we were taught axmanship by our very competent Scoutmaster. How to carry it (blade pointing away from self), how to sharpen it with a file and stone, and how to use it. Then my grandfather, who used to hew railroad ties in the 1920s, taught me some other tricks. 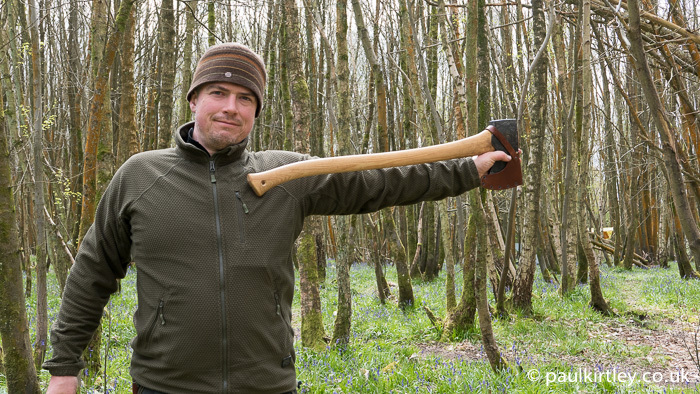 As a result I’m fairly competent with an axe, a full length “Michigan” style felling axe, not the shorter handled Hudson’s Bay axe illustrated here. Hi Paul, very good article! Each time I use my axe (rarely because the lack of wood) I think on my safety first. Good safety way the elbow balanced axe carry, I’ll try it next trip! 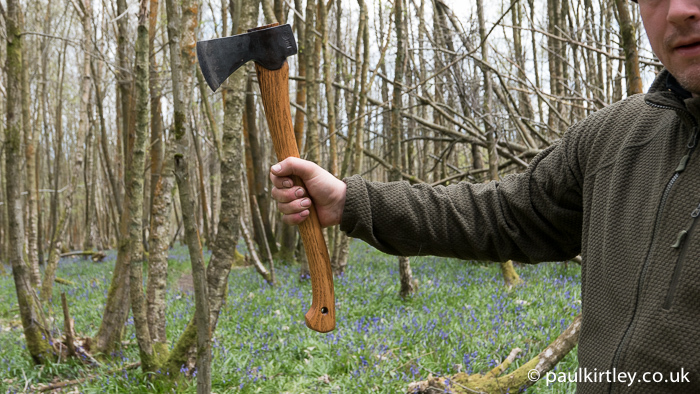 Such a wonderful article on the proper way to handle an axe and to safely cary it. 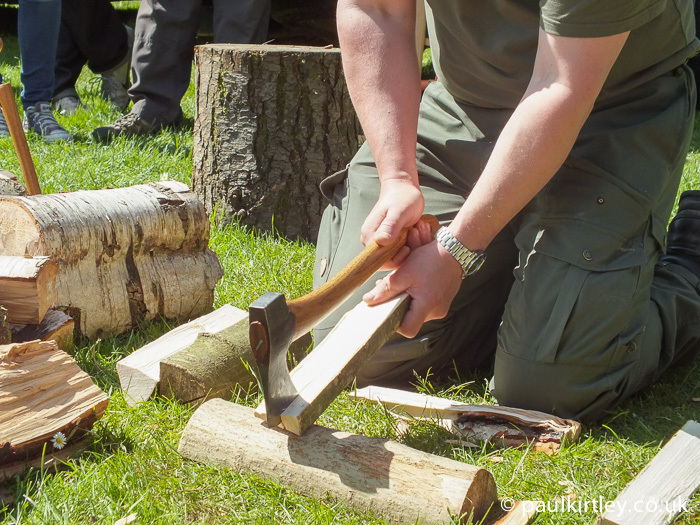 Plus the outstanding information on splitting kindleing so much good information and this article not only helps to be more efficient but a better and more rounded bushcrafter. Sir a humble thank you for sharing some of your knowledge with us. CHEERS MATE!